One of the daily difficulties I have is the need to hold my iPad in my left hand whilst I’m either typing or web surfing. Also my grip in that hand is poor so sometimes my precious iPad has been dropped. I also get quite bad pain in my left wrist, and have cortisone injections as a result. So I’ve been looking out for a stand that would hold my iPad, I use it to do so many things and if I don’t have to hold it all the time it would be some much easier to multi-task. Thanks to Amazon, (as a disabled person I don’t know how I would manage without them, so much easier and cheaper to buy on line, than having to struggle to get to shops) I found a product called a Standzfree. 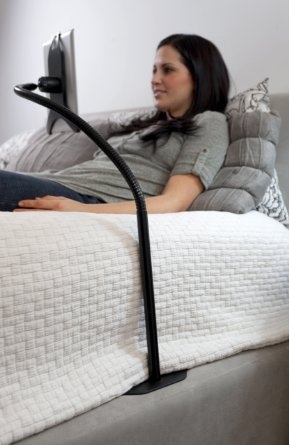 It has a thin base that easily goes under my bed or sofa and then a height-adjustable pole, with a flexible arm at the end of which is a ball & socket joint with a manoeuvrable tri-shaped holder for the iPad, enabling it to be moved into the optimum position for use. My only minor niggle is that the single clip that helps to keep the iPad in place clips into the slot used for charging the iPad. 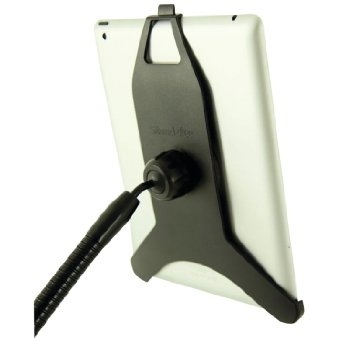 This means the iPad is slightly less stable in the stand if used whilst on charge. So apart from it’s overnight change for cloud back-up I try only to charge the iPad when watching a streamed film or broadcast, when stability is less of an issue. It was well worth the money, for £61 including delivery I now have the ability to write this blog whilst laying comfortably in bed! Reduced pain and luxury!